A women’steam from Phoenix, Ariz.,representing the USTA Southwest, finished second at the USTA League 4.5 Adult National Championships held at the Jim Reffkin Tennis Center in Tucson, Ariz. from Oct. 8 to Oct. 10. The Phoenix team, which plays out of Arizona Country Club, reached the finals before ultimately falling in a tight 3-2 contest to a team from San Diego, Calif., in the championship match. The team was captained by Tammy Auther and features Leslie Rangel, Yuka Shoji, Robin Parmley, Betsy Owen, Astrid Koh-Stenzer, Cathy Ellington, Loretta Brown, Ellen Baumann, Karen Schaal and Beth Thompson. The team went 2-1 in pool play, tied with Intermountain (Idaho), but advanced on number of matches won in their flight. Southwest had beaten Intermountain on the first day 3-2, but fell in their second match to Midwest (Bloomfield, Mich.) 3-2. The Southwest team finished with a 12-3 season record, losing just once in local play, and then twice at Nationals.The top four national teams in order of finish are: San Diego, Calif., Phoenix, Ariz., Mill Valley, Calif. and Vancouver, Wash. This year’s USTA League 4.5 Adult National Championship had drawn the top 34 teams (17 men’s and 17 women’s) from throughout the nation. USTA League is celebrating its 30th anniversary this year. Since its inception in 1980, USTA League has grown from 13,000 participants in its first year, to over 750,000 players across the nation today, making it the world’s largest recreational tennis league. 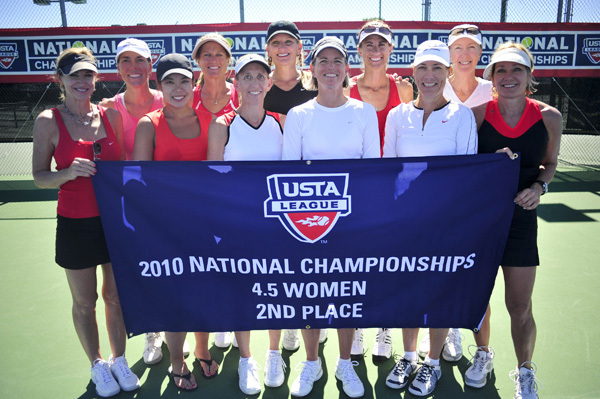 USTA League was established to provide adult recreational tennis players throughout the country with the opportunity to compete against players of similar ability levels. Players participate on teams in a league format, which is administered by the USTA through its 17 Sections. The league groups players by using six National Tennis Rating Program (NTRP) levels, ranging from 2.5 (entry) to 5.0 (advanced). USTA League is open to any USTA member 19 years of age or older. It features Adult and Mixed Doubles divisions, as well as a Senior Division (age 50 or older) and a Super Senior Division (age 60 or older). Head Penn Racquet Sports is in its 23rd year as official ball of USTA League. For more information about USTA League or the USTA as a whole, visit www.usta.com. Congratulations again to our USTA Southwest Central AZ ladies. Second place is an awesome finish!